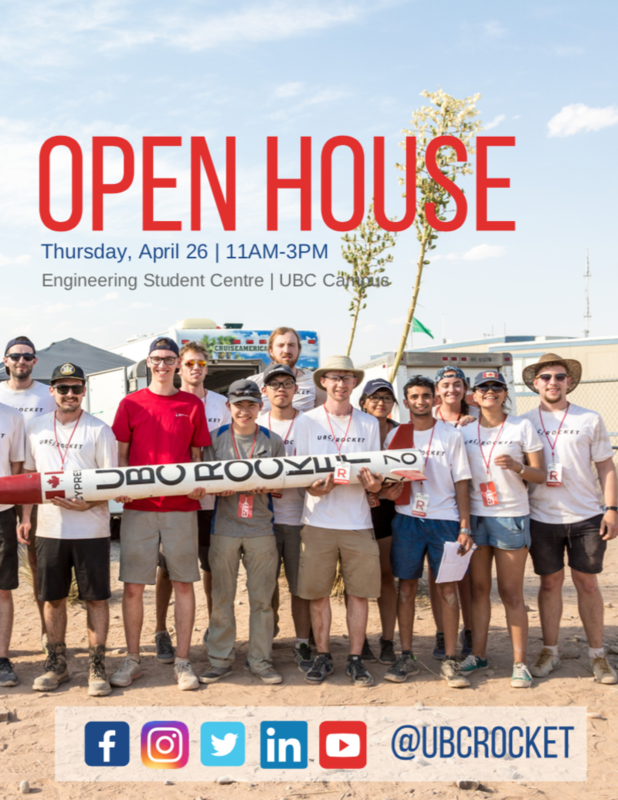 UBC Rocket is a student-run engineering design team at the University of British Columbia dedicated to the design, manufacture and launch of suborbital rockets. Last year at the Spaceport America Cup, our rocket Cypress launched us to first place in the competition's most competitive category: 10,000 ft. Commercial-Off-the-Shelf (COTS). We will be returning this summer to re-launch Cypress as well as compete with a new 10,000 ft. rocket and a new 30,000 ft. rocket! Furthermore, we are working on a long-term project that will send us to the edge of space: an advanced liquid propulsion system set to reach 300,000 ft.! We are inviting community members and news organizations to come learn more about our team as well as the exciting world of rocketry and aerospace. You will get the opportunity to view our rockets and custom-designed launch rail, speak with our members, and maybe even see a live flow control demonstration from our liquid 300,000 ft. engine. This event is opened to all ages and we'd be happy to answer any questions you may have about our team there! We hope to see you soon!